Fast forward to 2011: participation was 74 percent. It has barely budged. (Last year, participation was 68 percent, but Vanguard said past experience indicates this figure will rise to roughly the same level when all of its clients turn in their data). Auto enrollment, based on concepts in behavioral economics, held that employees just needed a nudge to do what was in their own best interest anyway: saving for retirement. If they were automatically enrolled in their 401(k) – and even if they had the ability to opt out if they wanted to – they would remain and save. The concept clearly works – if it’s adopted. 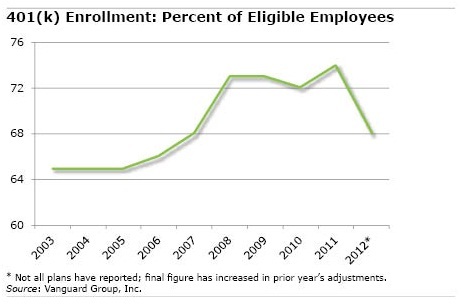 But enough time seems to have passed that we can safely declare that the employers that were going to adopt auto enrollment already have. There’s little reason to expect any great improvement in participation rates in the future. Perhaps it’s time to ask a new question: Now what?